Despite it's name, the modern town of Davenport was not founded by Captain John P. Davenport. The good captain founded Davenport Landing, a site just north of the current town. The town's origins only date back to 1905, and the very reason for the Coast Line Railroad's existence was the cement plant that was built there in that year. Noting the competition presented by the Ocean Shore Railroad, the Coast Line was founded by the Southern Pacific specifically to reach the site of Davenport, even though they claimed their goal was a route to Pescadero and, eventually, San Francisco. Indeed, the grading work was already in its preliminary stages north of Boulder Creek to connect the town to Pescadero via a long tunnel under Waterman Ridge. This route would then loop back to Davenport. The Ocean Shore's plan was always to reach San Francisco, but Davenport was the most profitably commercial venture along the North Coast. William J. Dingee was the entrepreneur who saw the potential of Portland cement production on the western slopes of Ben Lomond Mountain just north of San Vicente Creek. He took control over the small Santa Cruz Lime Company that was located on the bluff overlooking the creek in 1905, and also purchased around 100-acres of land from the Coast Dairies & Land Co. Construction started immediately at the briefly-named town of San Vicente on what would soon be christened the Santa Cruz Portland Cement Company. The Ocean Shore Railroad reached the plant just around the time that construction was completed, and for the better part of a year, the Southern Division of that railroad profited off of the cement output that was shipped via Santa Cruz Depot. The 1906 San Francisco Earthquake, unfortunately, caused a change in direction for the nascent cement plant. Recognizing the increased need for Portland cement in San Francisco, they negotiated a contract with Southern Pacific, fearing that the damaged and ill-equipped Ocean Shore would be unable to ship the needed loads of cement to San Francisco in sufficient quantities. The Coast Line, thus, was given precedent at the plant and the Ocean Shore loading dock was forced further north at a site to be named Blue Gum. On the north and south sides of the cement plant, the town of Davenport sprang up. 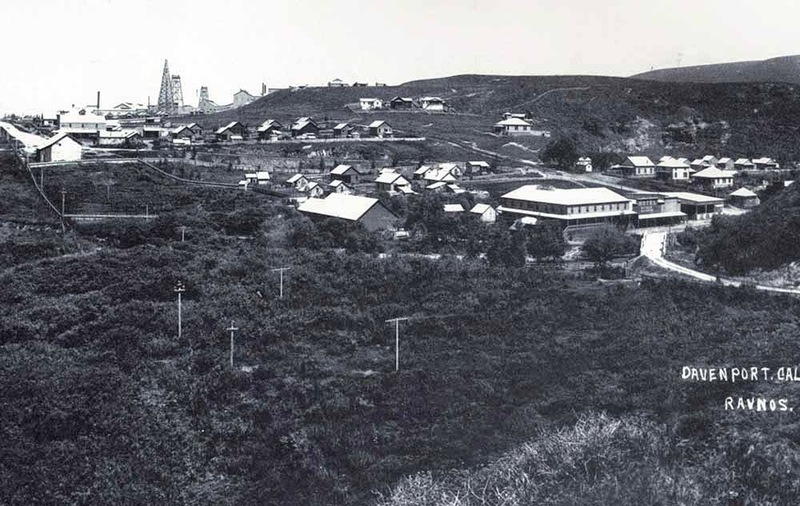 The "old" town was located between San Vicente Creek and the plant. Needing more space for workers, the company purchased additional land from the Coast Dairies of J. Morretti and initially named the flat north of town Morrettiville, but it quickly became simply "new" town. Davenport got its name in 1905, but the post office had been called that since 1889 because of the Landing two miles north of town. It moved in 1906 to the town and remains there today. The Ocean Shore Railroad, despite lacking freight access to the plant, maintained a siding and spur at Davenport. It also had a passenger shelter that measures 20' by 10' with the side facing the track open. 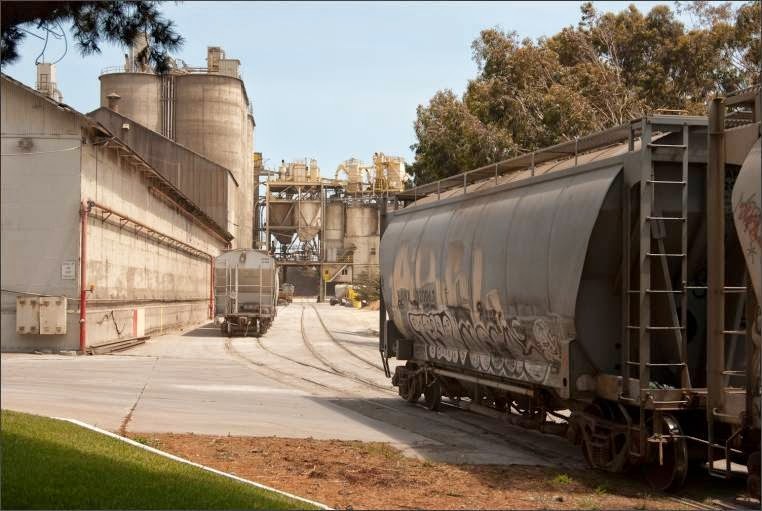 The four-car spur serviced San Vicente Landing, a loading dock for the Santa Cruz Lime Company which was a subsidiary of the plant. It was located just opposite the town on the west side of the tracks. Service to the station began on June 15th, 1906, and continued right until the closure of the line in October 1920 (afterwards, San Vicente Lumber Company trains passed through without stopping until 1923). The Ocean Shore right-of-way continued northward for another three miles to Swanton, and then beyond on private logging rails. The Coast Line Railroad, meanwhile, established their line in August 1907 and set up a station directly in town just beside the County Road on the east side of the tracks. The Coast Line, having access to the plant, maintained extensive sidings, many of which still exist today, though they are no longer in use and haven't been since 2011. In 1912, Davenport's cement plant sidings numbered four plus the mainline. At least two spur lines were later extended into the plant itself, servicing loading docks. 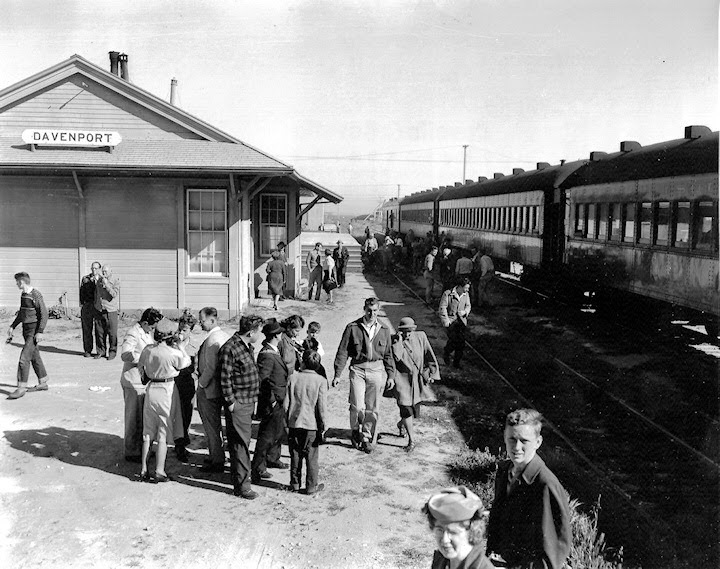 The Ocean Shore station was located 10.8 miles north of the Ocean Shore Depot in Santa Cruz while the Coast Line station was located 11.5 miles north of the Southern Pacific Depot in Santa Cruz. The Coast Line's end-of-track was just north of the plant and remains that way today. Passenger service along the norther routes was never strong, and it mostly serviced laborers at Davenport and north of Swanton. Coast Line passenger service was hardly existent after 1908, and the Ocean Shore demoted Davenport to a flag-stop around the time it reincorporated in 1911. 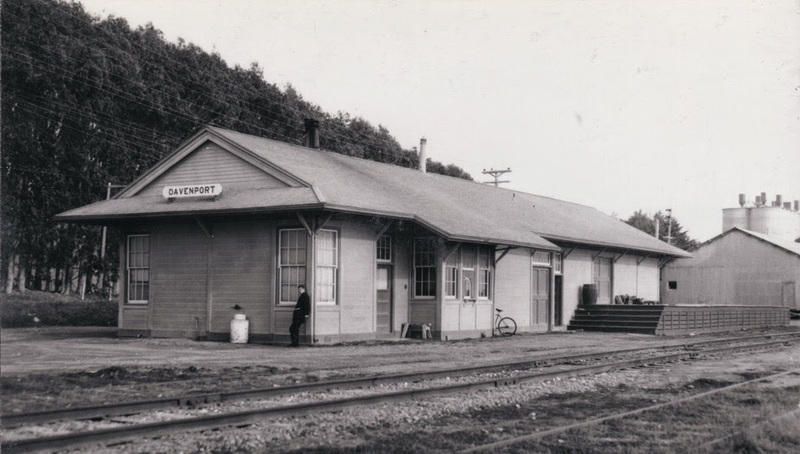 In the end, Davenport became just another forgotten station on both lines, with the buildings finally being demolished as disuse and disrepair forced their condemnation. The cement plant continued operating until 2010. Rmc-Lonestar took over the plant in 1970 and then CEMEX took over operations in 2005. The future of the site is uncertain and rail traffic has not resumed to the town since the tracks were cleared in 2011. Donald Clark, Santa Cruz County Place Names: A Geographical Dictionary (Scotts Valley, CA: Kestrel Press, 2008). Rick Hamman, California Central Coast Railroads. Santa Cruz, CA: Otter B Books, 2002.
my timetable for March of that year shows no passenger service to Davenport. I would be interested in hearing what exact year regular passenger service was discontinued.